Paris is a city of culture, of food & wine, of beauty, of charm, and of… wackiness. It's all well and good to visit the great art museums and dine at delicious bistros, but you also have to judge a city by what you might call the Wack Factor. A city ain't got that zing if ain't got a certain wackiness. 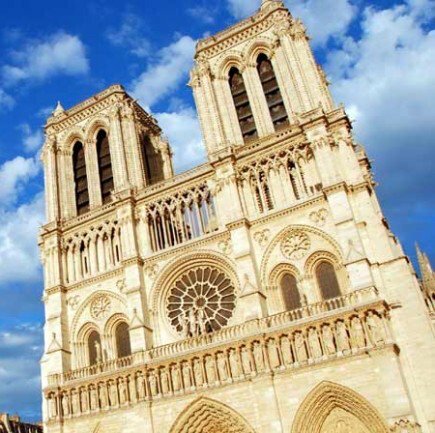 Luckily, for us and for Parisians, 2,000 years of history has gifted to Paris a broad spectrum of places to see and things to do. We write about the loveliness and diversity everywhere else on this website, but today let's turn our attention to the equally-important Wack Factor — yet another vital area of urban accomplishment in which Paris can hold its own. 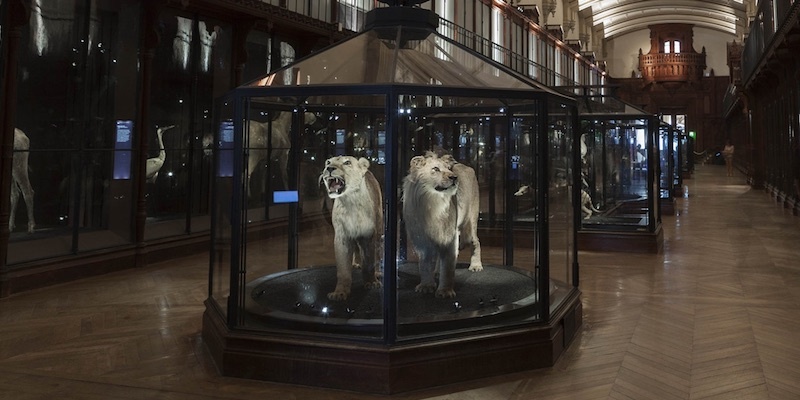 To be fair, the museum's full name adds "et de la Nature" (The Museum of the Hunt and of Nature) and its stated aim is to "exhibit the relationship between humans and animals through the ages… based on exceptional collections of ancient, modern and contemporary art." That's well and good, but the real reason most people come here is to gawk at the amazing collection of stuffed animals, mostly mounted heads. You find it in the Marais. 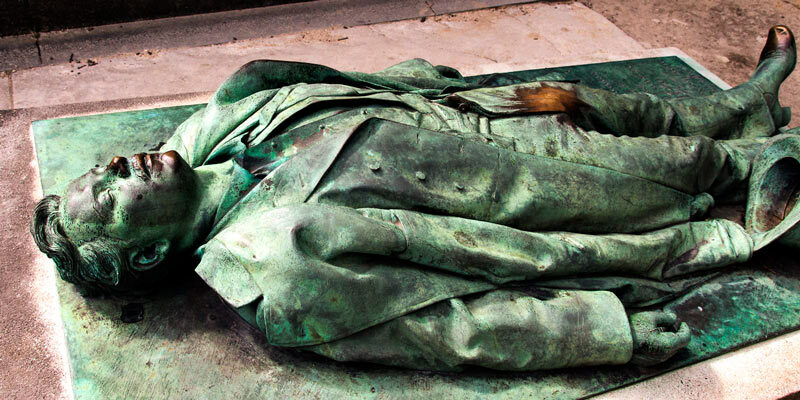 Pere Lachaise, just inside the 20th Arrondissement, is justly the most famous cemetery in Paris. It's the graveyard of the rich and famous… and infamous. Its Wack Factor rating is greatly improved by the presence there of the grave of a 19th-century Parisian named Victor Noir who was killed in a foolish duel. Paris may not be the most accessible city — there are many older buildings that don't have elevators, and the Metro is a maze of stairways — but a tree in the Latin Quarter has survived thanks to prosthetic aids. 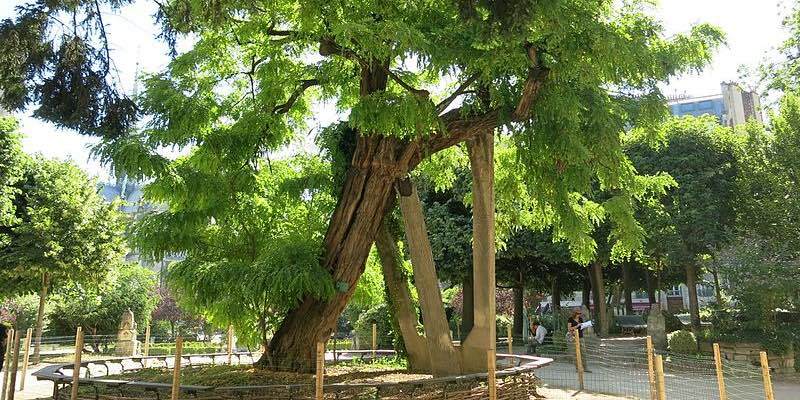 The locust tree on Square René-Viviani dates back to the beginning of the 17th century, making it the oldest tree in Paris at well over 400 years. But, at that age it needs some help in the form of concrete "crutches" and a trunk injected with supporting concrete. Not many visitors make it out to Parc de Belleville in the 20th Arrondissement. 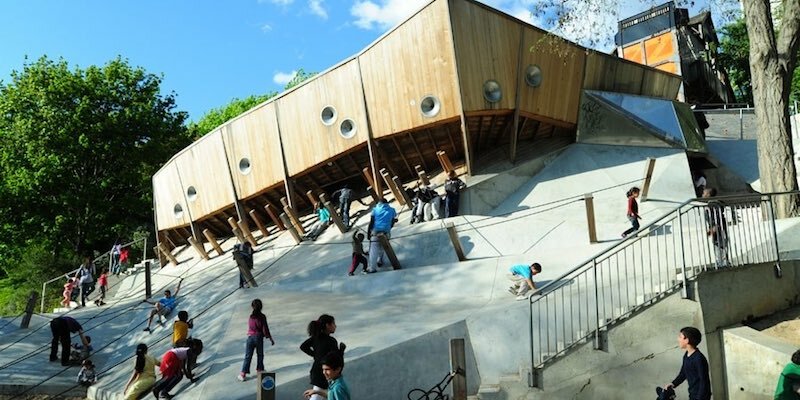 But if you're travelling with children you may find it well worth your time to hop on Metro Line 11 and alight at Pyrénées to make your way to Parc de Belleville and the longest slide in Paris. Taking advantage of the hill the park is built into, the slide turns and twists (but very, very gently) to the bottom of the slope. If the child wants to ride again, it's easy and fun to climb back to the top on the built-in (and safe) climbing wall, complete with hand- and foot-holds. In fact, the entire children's playground is wacky and wonderful. Added bonus — the view of Paris and the Eiffel Tower from the plaza at the top of the park is one of the best! 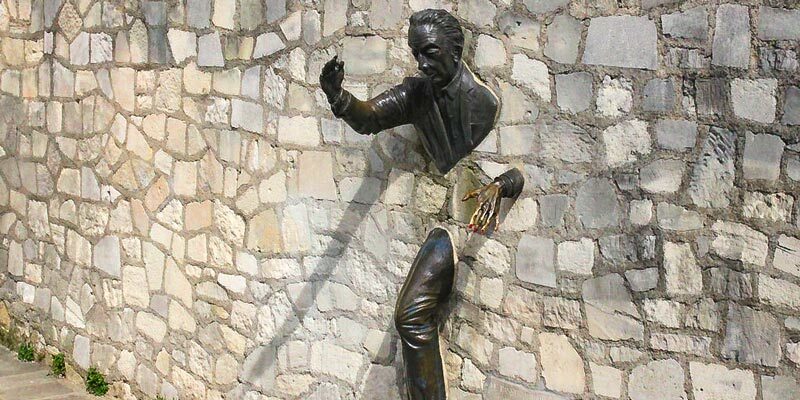 The idea came from stories by Parisian writer Marcel Aymé about a man who could pass through walls. (Le Passe-Muraille — read the story in translation.) Aymé lived at 26 Rue Novins in the 18th Arrondissement, up in Montmartre, and his apartment windows looked onto this small place that was later named his his honor. After Aymé's death in 1967, his friend and neighbor Jean Marais (an actor, writer, painter, and sculptor) created this Passe-Muraille, shown walking through the stone wall into the place where the writer could look down on him, were he still alive. Even when legal, horsemeat could be sold only at dedicated boucheries chevalines. 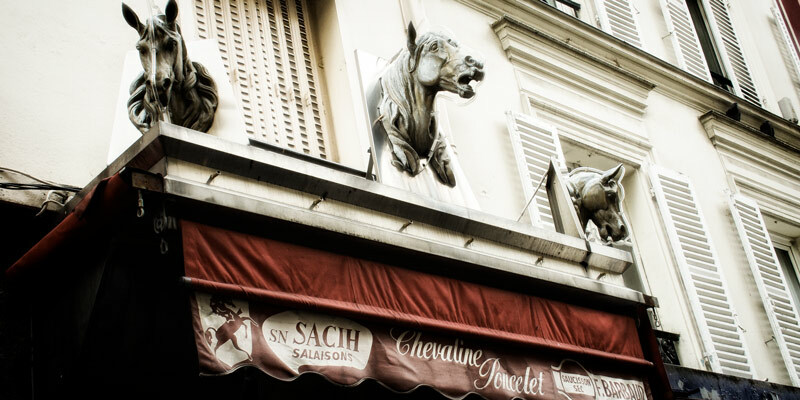 There are a handful still operating in today's Paris, including Chevaline Poncelet on our favorite market street in the 7th Arrondissement, Rue Poncelet. If you like, you can even go to the French horsemeat website. Unexpectedly, in the middle of busy Saint-Germain, there is a bust of Taras Shevchenko in the park-like square named for him. "Taras who?," we hear you ask. Well, if you had any Ukrainian ancestry you wouldn't have to ask. 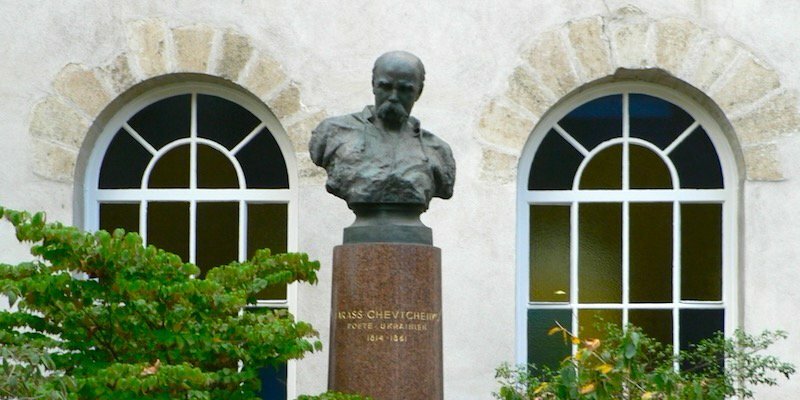 Taras Shevchenko is revered in that country, where he is regarded as the father of Ukrainian literature and even of the modern Ukrainian language. The Jardin des Plantes in the 5th Arrondissement is where you find the Grande Galerie de l'Évolution, the natural history museum dedicated to the diversity of life, the connection of animals, and exploring humankind's impact on the natural world. Up on the third floor, in one of the original rooms of this grand building, is the Hall of Endangered & Extinct Species. 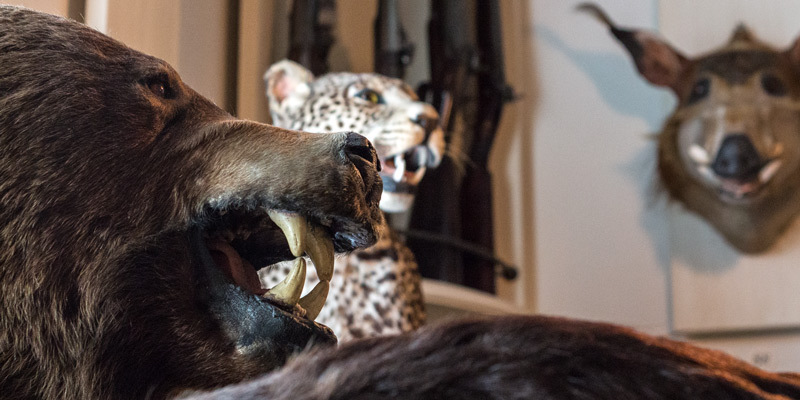 This room is a shrine to animals we will never see again. There are more than 400 animals and plants here that once flourished on earth, or that are now threatened. The dodo is one obvious example, but you'll also find the black emu, the aepyornis (an extinct giant bird of Madagascar), the Sumatran tiger, and two threatened Madagascar primates — the aye-aye and the nocturnal lemur. 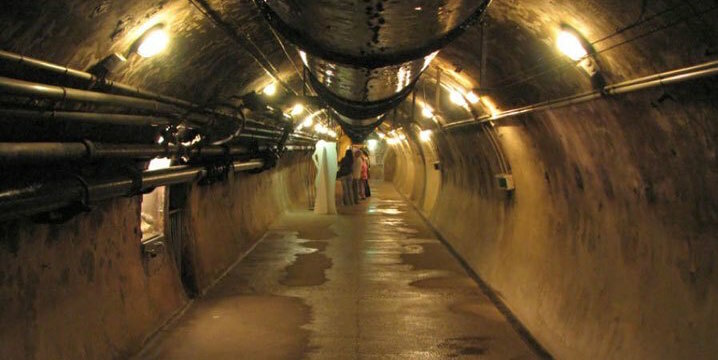 It's not unusual for a city to have égouts — sewers — but to conduct tours of them and have a museum dedicated to them… well, that may be just a week bit wacky. Non ? Built during the reign of Napoleon III in the mid-nineteenth century, under the direction of his city planner, Baron Haussmann, the Paris sewers immediately became one of the Wonders of the Underground World. "Who wouldn't want to visit them?" we imagine a proud city engineer of the time asking. Actually, the 1300-mile network of tunnels, if laid end to end (insert your own joke here), would stretch from Paris to Istanbul. Did you know you can get cold sparkling water from Paris public water fountains? Starting with one dispensing station installed in 2010 in Jardin de Reuilly (12th Arrondissement) the idea was to provide sparkling-water-mad Parisians with sources to fill up their own bottles, thereby reducing the large number of disposable plastic bottles that are piling up in landfills and polluting the oceans. The number of sparkling water fountains, called Fontaines Pétillantes, is increasing, most of them found in the city's parks. 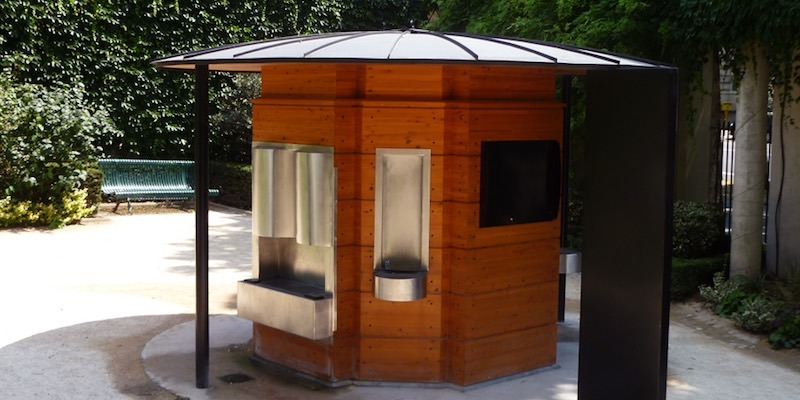 Some are kiosk-like installations, such as the original one at Jardin de Reuilly (pictured), others are simple sidewalk filling stations, looking something like a propane tank on a pole. Eau de Paris, the water utility, has a map showing where to find them all. 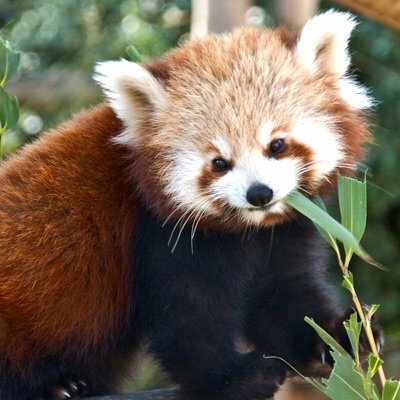 When you think about it, this is about as wacky as a fox. These days you may know Serge Gainsbourg as the father of Charlotte Gainsbourg (or as the husband of Jane Birkin, if, in fact, they ever married), but, man, he was a cultural hero in France right up to his death in 1991, just shy of 63 years old. Gainsbourg was an iconoclastic rule-breaker in the songs he wrote and sang, and in his films. Vanity Fair once wrote about his "poetic, nicotine-and-alcohol-fueled, sometimes scandalous life" — and that was written sixteen years after he had died. The house where he lived and died in the 7th Arrondissement has apparently been left just the way it was at the end of his life. But we don't really know, you'd have to ask Charlotte, the sole owner of the maison. 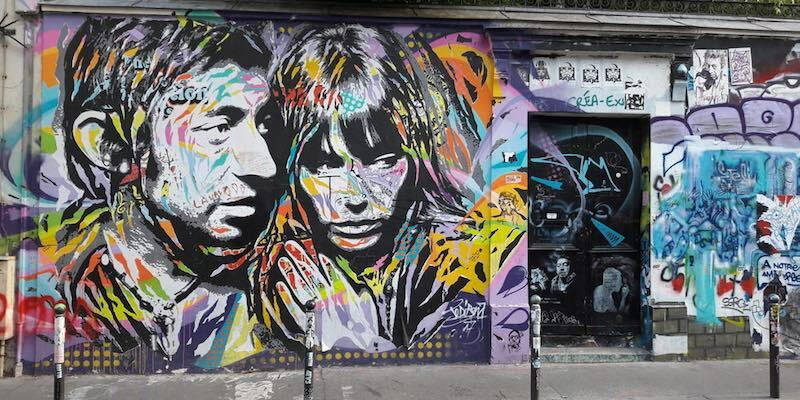 Even though the house isn't accessible, it remains a mecca for fans (many not even born when Gainsbourg was alive) and the wall in front is famous for being covered in graffiti.